Another pre-PMA release! 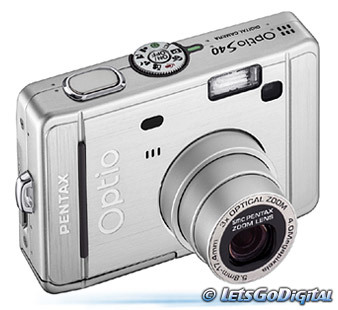 Today Pentax introduces their new ultra-compact 4 Megapixel camera; the Optio S40. This attractive camera has an aluminum exterior, lies comfortable in the hand and has a nice stylish design. The effective 4 Megapixels resolution ensures photo realistic photos and the 3x optical zoom combined with approximately 2.6x digital zoom results in an all-round 8x zoom. The ultra-compact design embraces the unique Pentax Sliding Lens system that results in very compact dimensions. The camera is compatible with 2 AA batteries or 1 CR-3 battery. The dimension of 89x58.5x25.5 and a weight of only 125g make the new Optio S40 comfortable and handy to carry it with you at all times. The new Optio S40 features a smc Pentax lens, one of a series renowned all over the world for its high quality. The 3x optical zoom with a focal range of 35-105 (Equiv. in 35mm format) allows the user to capture images in a comfortable way. The sms lens is comprised of 5 groups of 6 elements crafted from glass, and features two lenses crafted to be aspherical on each side. To enhance its zoom capability the Optio S40 can expand its zoom with 2.6 digital zoom achieving a total zooming power of 8x. The camera is user-friendly; all buttons and controls have been located within easy reach when in a ready-to-shoot position. The buttons on the back of the camera have been made bigger for easier control. To offer the utmost in customized, easy operation, the OptioS40 allows four frequently used functions to be selected from a choice of ten (recording size, image quality, exposure compensation, metering, white balance, sharpness, saturation, contrast, ISO, and AF area). Shooting modes can be easily selected with a handy dial positioned in the middle of the top surface. Simply set the dial to one of the nine modes described below and let the camera take care of all relevant settings automatically. Those shooting modes are: Auto Select, Portrait, Landscape, Night Scene, Movie, Voice Recording, Digital Effect, Program and Picture. In addition to placing Portrait, Landscape, and Night scene modes directly on the mode dial, the Optio S40 also offers 10 picture modes with exceptionally easy access. All you have to do is just select the icon most appropriate for the scene, compose, and then capture. The 10 picture modes are: Flower, Self Portrait, Surf, Snow, Sunset mode, Museum, Text, Food, Landscape portrait and Marine. To enhance user-friendliness the Optio S40 offers a help function that can be easily accessed when in recording and playback modes, displaying simple explanations of all button functions on the screen. The Optio S40 supports PictBridge, a new direct-print standard released by CIPA (Camera and Imaging Production Association). With this advantage, the Optio S40 can be connected directly to a printer that supports PictBridge via USB cable and offers control over printing, resizing, digital filter, and other functions, all without the need for a PC. Optional accessories are: AC Adapter, Waterproof Case (O-WP3) and a remote control unit.